Please see below for applications where there is is a 28 day consultation period (provisional statements, a new or major variation of a premises licence or club premises certificate). If you can't find what you are looking for please contact us. 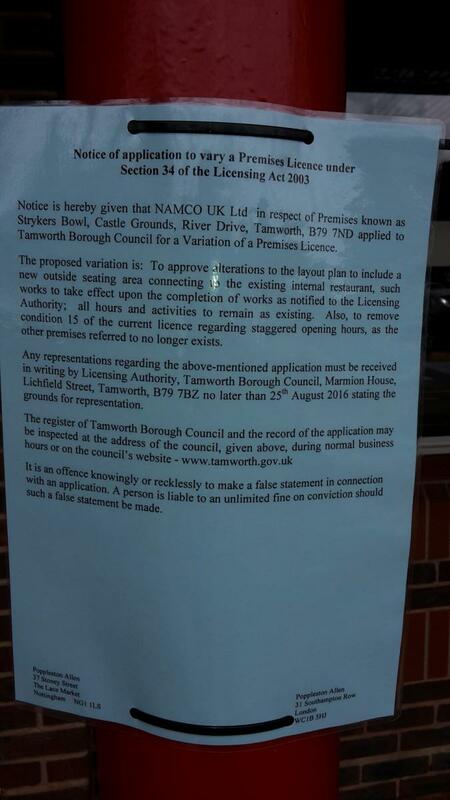 Application to vary premises licence. Tamworth Rugby Football Club, Wigginton Lodge, Wigginton Park, Solway Close, B79 8ED. Proposed Convenience Store (formerly The Dosthill Cosmopolitan Club) High Street Dosthill Tamworth B77 1LG Application for a provisional statement to be granted. Application for a provisional statement to be granted. Olivers, 19 Lower Gungate, Tamworth, B79 7AT. Making representations: Representations must be made in writing to the address given below. Please note, it is an offence knowingly or recklessly to make a false statement in connection with an application. The maximum fine for which a person is liable on summary conviction for the offence is not exceeding £5000.